Your BMW’s high performance muffler is a blend of acoustical design and fluid dynamics. The muffler works not only to quiet the car, it also manages exhaust gases for optimal engine operation. BMW stock mufflers are built with mild steel instead of stainless steel, which can cause early rust damage. 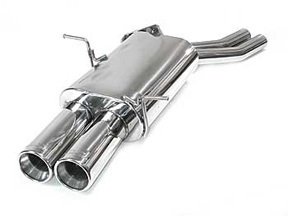 We can install a high-performance, stainless steel BMW muffler, giving you the performance and durability you need.